The second that Gary Reuter yanks up the green sliding metal door of a self-storage unit, the pack of hunters turns on its dozen flashlights. Here are a few of the photos I took during the installation of the class show at Mess Hall. If anyone needs any of these photos removed, please let me know. Enjoy. CHICAGOPEX 2008 is the 122nd annual exhibition of the Chicago Philatelic Society, and is annually the largest stamp show in the Midwest. Over 4800 pages of philatelic material will be on display, and 75 dealers including the United Nations Postal Administration and the United States Postal Service will be in attendance. Both the show and parking are free. This year the theme of CHICAGOPEX is “Enjoy Scandinavian Culture”, as we will be hosting the Scandinavian Collectors’ Club as well as the Mobile Post Office Society and the Auxiliary Markings Club. The 300 frame exhibition is an American Philatelic Society “World Series of Philately” show, so the grand award winner will be eligible for the APS’ Champion of Champions in 2009. Among the exhibits are Eliot Landau’s “Lincoln, Slavery and the Civil War” which is on its way to the Smithsonian National Postal Museum to help commemorate Lincoln’s birth bicentennial in 2009. Also this year in addition to the many fine dealers (the bourse is sold out again this year), Regency-Superior will be holding an auction at the event. 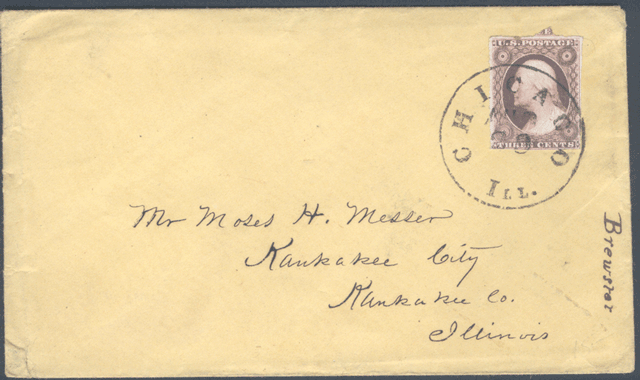 If you attend one stamp show event in your lifetime, CHICAGOPEX 2008 is the place to be! I will be hanging out in the Youth Booth (Lake Ontario room) most of the time where kids can get free stamps. If you stop by, please come say “Hello”; if I am not around ask someone. Greetings from my last night in Austin, Texas. I’m here with Temporary Services for an exhibit at a space called testsite. One part of our project was to do interview booklets on the band The Dicks and with Tim Kerr (of Big Boys, Poison 13, Lord High Fixers and many other bands). We never got a chance to see any Dicks members who are still alive and/or in Austin but we had lots of time to spend with Tim Kerr, and as an added ultra punk bonus, we got to have lunch and hang out with Ian McKaye for a few hours while he was in town for a talk. This morning, before going to one of many Mexican brunches, we briefly stopped at Tim and Beth’s house. 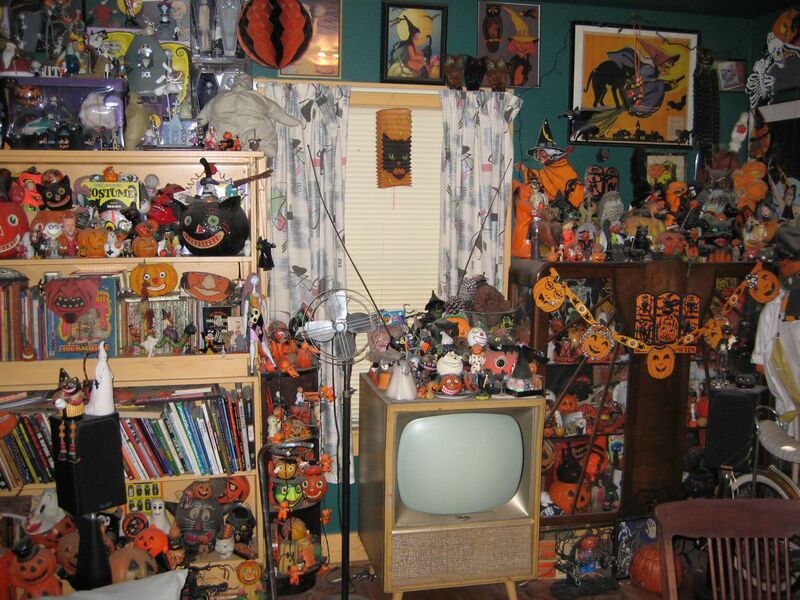 They’ve lived there since the early 1980’s and their home is an incredible overwhelming trove of toys, music stuff, records, books, art by Tim and many other people, old Halloween costumes and punk rock and other music memorabilia. In a “Voodoo Shrine” – which I probably should have photographed – there were items that past house guests added like old fingerless skeleton gloves that Glenn Danzig contributed many years ago. Set inside Chicago’s labyrinth of alleyways, Scrappers tells the stories of three men who support their families scavenging discarded metal with brains, brawn and battered pickup trucks. The film will be a feature length documentary that situates scrapping within the global marketplace through a verite style and a deep sense of emotional immediacy. The filmmakers met while studying at the University of Chicago, and were key crew members on two other feature length films now in distribution: Thax, which premiered at the 2007 Chicago Underground Film Festival and is available through Golden Age Gallery, and Crime Fiction, which premiered at the 2007 Slamdance Film Festival and is available through Anthem DVD. I attended a benefit for Scrappers earlier this year, and got a chance to watch some clips from the film (which I believe is still in post-production). 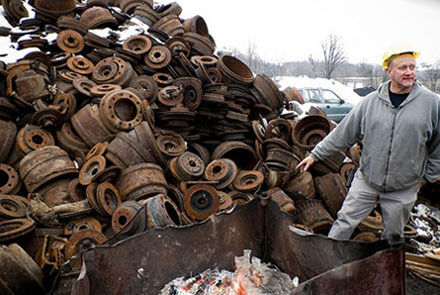 You can read more about the film and find resources for scrap metal enthusiasts here. Whatever the intention of the artist was in starting the collection, one of the major differences between an artist’s collection and that of a non-artist’s is whether or not the collection results in exhibition. Once the collection is exhibited, it becomes a piece of artwork—the viewers need to pay admission fee to the museum, they are not allowed to touch the display, and are prohibited from singling out an item and purchasing it. While participants may be required to pay admission to swap meets and the vendors could be particular about the fashion they display their collection, the main audience of the exhibition, be it a small vending stall, is still collectors. The vendors assume knowledge from the visitors to some extent, and they interact with each other face to face. In another words, the exhibitor and the audience are both on the same platform. The nature of the collection is more versatile than that of an artist’s: it is not sacrosanct and the number of the items could change, and so could the value of the items. Similarly, a collector displaying his collection will not make him an artist. He could be an authority in the field, and the items on display may not be on sale. The collector may not always be present at the exhibition site, and the relationship between the collector and the viewer may be more distant. Yet, the nature of the collection still remains to be a hobby: it is usually not regarded with any values outside the field. A few pieces from a collection of rocks may gain attention from geologists, but the collector himself will not be called a geologist. A collection of antique furniture could be praised for its beauty even from those ignorant of the field, but the collector will not be called an aesthetician. 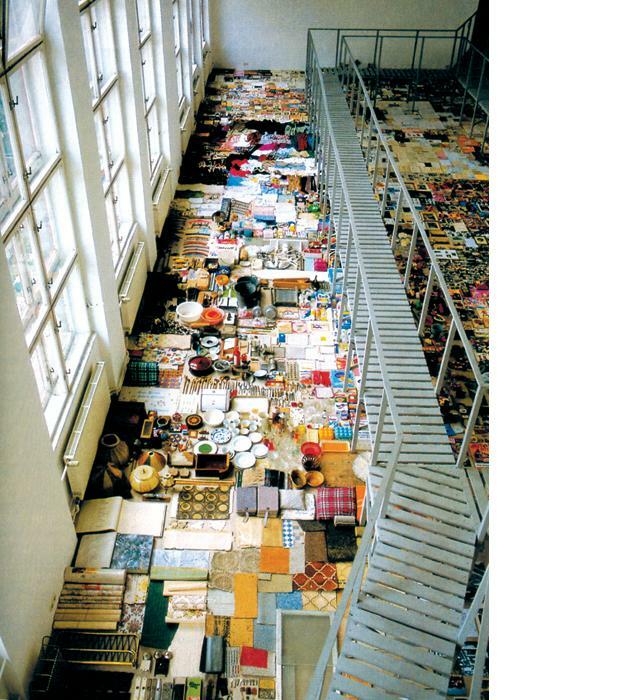 What makes a collection an artwork, then, is perhaps the uniqueness in the categorization of the collected items. 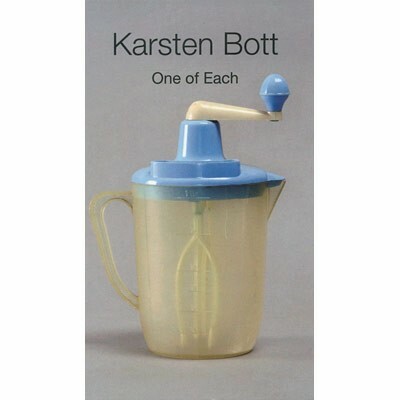 “Archive of Contemporary History” by Karsten Bott is a collection of everyday artifacts. The amount of the collection is in itself overwhelming. And since the collection is so vast and cannot be labeled easily, it does require some interpretation from the audience. 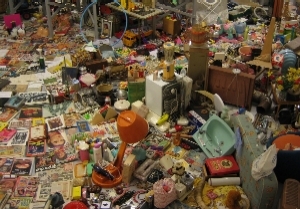 However, what makes Bott an installation artist is the uniqueness of the display and the categorization of the items. The effect of unique categorization is more explicit in Bott’s book, “One of Each.” The title already illustrates his ideas about categorization, with some mockery. Selecting 2000 items from over 500,000 items he owns, he attempts to create a sense of compiling an exhaustive encyclopedia by choosing objects that best represents the category. 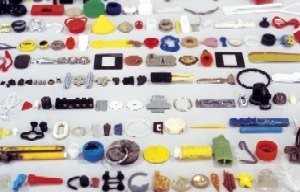 His idea of classifying the objects is more apparent since the items are labeled in the book, and displays how he defies and mocks the conventional categorization. He brings his personal perspective into the exhibition of his collection, and he makes viewers to accept that perspective.